This client came to us presenting with adult acne. She had had acne in her teenage years but in Summer 2017 it returned at the age of 41. The breakouts she was experiencing were under the skin and quite painful. At the end of her Skin Fitness Assessment, we prescribed skin specific supplements, namely Skin Accumax, which are are a plant-based nutraceutical which works on balancing hormones affecting the skin and also contains Vitamins A,C & E to aid with collagen prevention and reduce scarring. We also recommended a topical skincare regime to specifically target the inflammation in the skin and to prep the skin for the recommended in-clinic treatments. We carried out monthly treatments for 5 months and here are the results. 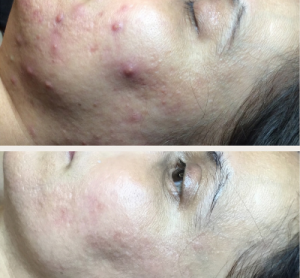 Our client is now having a course of Collagen Stimulation Therapy treatments done to target any scarring that is left on the skin as a result of the acne.